We updated the Kernel to version 2.6.38.3 which comes with neat little features like better hardware support for wireless and the famous cgroups patch which brings more speed under heavy load. The underlying Debian Squeeze system was upgraded to Debian Testing (alias Wheezy) which will provide newer applications through the lifecycle of Neptune 1.9.9. KDE SC 4.6.2 makes it debut in ZevenOS-Neptune 1.9.9 with lots of updates and the typical Neptune look & feel and a new default font, the Ubuntu Font. 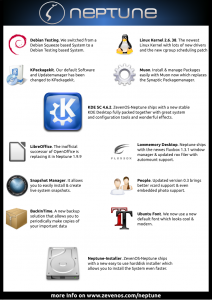 For the sake of consistency we replaced Synaptic & Software Center with its KDE/QT based counterparts Muon & Kpackagekit. Libreoffice replaces OpenOffice.org and the contact management software people was upgraded to version 0.3 which brings better vcard support and a new layout. With Snapshot Manager we introduce a new cool feature which allows you to easily customize your live system and save the customization to a file that you can share with your friends & colleagues. The Harddisk Installer has been rewritten and allows you to install ZevenOS-Neptune 1.9.9 faster than ever. 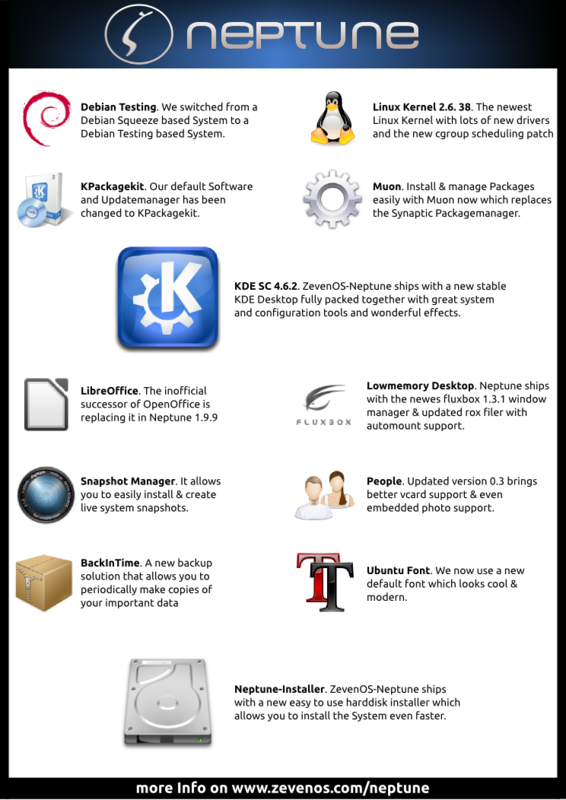 ZevenOS-Neptune 1.9.9 is based upon Debian Testing (Wheezy) and gets constant updates via it. We also provide updates on our own repository for stable and unstable software so you will get constant software updates when necessary. Kernel 2.6.38.3 is the heart of ZevenOS-Neptune 1.9.9. It provides the newest linux drivers and the cgroup scheduling patch which gives you more performance on heavy load. ZevenOS-Neptune 1.9.9 ships with KDE SC 4.6.2. The Ubuntu Font is now the default font for all applications. KPackagekit & Muon provide packagemanagement and easy installation of applications. LibreOffice is the new default all in one office application. It can read & write OpenDocument Format aswell as Word, Excel & Powerpoint documents. It even handles importing & exporting PDF files. Snapshot Manager provides you with an easy to use customization utility for your live media. It allows you to install already existing snapshots or creating your own ones. Snapshots store customized live system configuration & apps in a read only compressed file. ZevenOS-Neptune 1.9.9 ships with a new hard disk installer that allows you to install the system with a few clicks directly from your live media. It also allows you to install customized (e.g. with snapshot) versions of the live media. Thanks I look forward to trying it out. The download is slow it is going to take a few hours. I really liked the older versions. At least, a Debian kde 4.6.2 distro. This KDE is the best of 4.x, I will install zeven in my netbook. Todavía espero una distro que sea full btrfs comprimido. Try perhaps the torrent one or the speedier 3 parts 7zip archive (1&1 Server). Where is the md5sum (or sha1sum) of the neptune199-kde-final.iso? Why don’t you just upload it to sourceforge? Download speed is very low with with your server. Try torrent or the 3x7zip parts server. They are a lot faster. Sourceforge needs approval and registration. I very much like what I see in the “live” mode on USB but when I try “persistence” the boot process grinds to a halt at about 8 minutes and never does complete. This happens on both netbook (eeepc1000HE, atom 280, 2GB RAM, 160GB HDD) and Acer Travelmate (duo core 2.27, 2GB RAM, 160GB HDD). Md5sum checks out. there is a bug on the keaboard key map (z instead of y)have to use z to get y and vice-versa. Thanks gf. Just type in live for password if it asks for password. Normally it should not ask for password. And btw. when is it exactly asking for a password ? Thank you for your reply. I removed quiet and splash boot parameters and upon booting Live (EN) got this error message. “Cannot mount /dev/loop1 (0: unknown) on /cow”. Hope this is helpful. It seems to me that the live-rw persitency image was not fully created or formated. How big is it ? Does it fit on your usb stick ? Notice that FAT32 does not support one file bigger than 4 GB in size. I went with the default 512MB of persistence. Truth to tell my machines had the exact same problem with Neptune 1.0.0 (I think it was) and it was never solved. So if I’m the only one with this issue it must be a weirdness in my computers. I’m willing to keep trying to fix this if you have any other ideas. If it asked if you want to really format that file than agree. After that you should reboot and try to boot with the persistency option again. It should work. Yay! That fixed it. Not only a great OS but great support! i hoop you can help me. so i have zevenos 1.1 livecd end when i test cd it tel me find7 file erros. It might be an ISO error. Please check the md5sum. i am olso try for backtrack but thats not whorking stil. Please register in the forum for proper support. I don’t think we can solve it here in the comments sections. help??? i need the iso file whit out erros . Gentlemen you’ve done a great job! I just installed Neptune and I must say that the best pure Debian-based distro I’ve ever seen! alwhorks fine,only no stations whil be find. end ther is 1 nex to me? ps one myn evo its whorking fine. 310.562261] padlock: VIA PadLock not detected. [ 337.738456] com_on_air_cs: valid client. Dedected is no longer supported in ZevenOS. I guess the error might be due to an old version of dedected or an not really supported card. hy thx for yor anser. end what do you meen whit not really supported card? i pay 300euro for it f22. end is so that all type 2 from D&A CARD ARE SUPORT ?????????? one the beack side is ekst DAB ? but i bilve that all D&A are suport? nowe i have ibm nieuwe whan . Hello. I downloaded the ZevenOS 5. I will burn a CD. It boots up, the logo screen, then asks user and password. I tried “root” and other linux user / password, but I can not. Please help me. You posted on the wrong article.